Start location: Talk to Islwyn inside the elven woods (see guide for more details). Items: Antipoison potion, rope, food, attack, strength or defence potions are an advantage, Glarial&#39;s pebble, a spade, Glarial&#39;s amulet are an advantage. NPC: Islwyn (main quest npc), Eluned. Items for the next part: Antipoison, some (very few will do) food. To start off, go to the quick route to Arandar, you can find this on your map, it&#39;s located south-west of the gnome stronghold and north west of Ardougne. 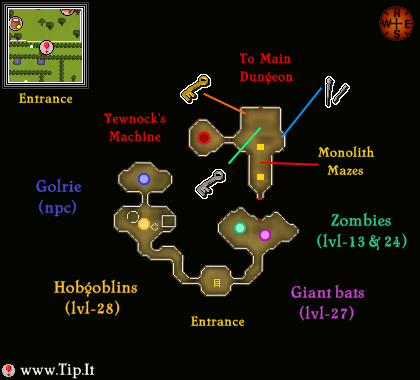 Here&#39;s a helpful map of the area for your reference, showing most of the traps. From the big gates, follow the road that leads south. You will pass some dire wolfs. Continue south past a trip wire and over a balance log. From the balance log, walk south east to the dense forest. On the other side of the dense forest, walk southwest until you reach the jump leaves. Jump over the leaves. From this point, there are 2 start points. The Elves where you start the quest move between each two every few minutes so check them both. From the jump leaves, walk a short distance straight south to the dense forest. Once through the dense forest, continue east past the trip wire. 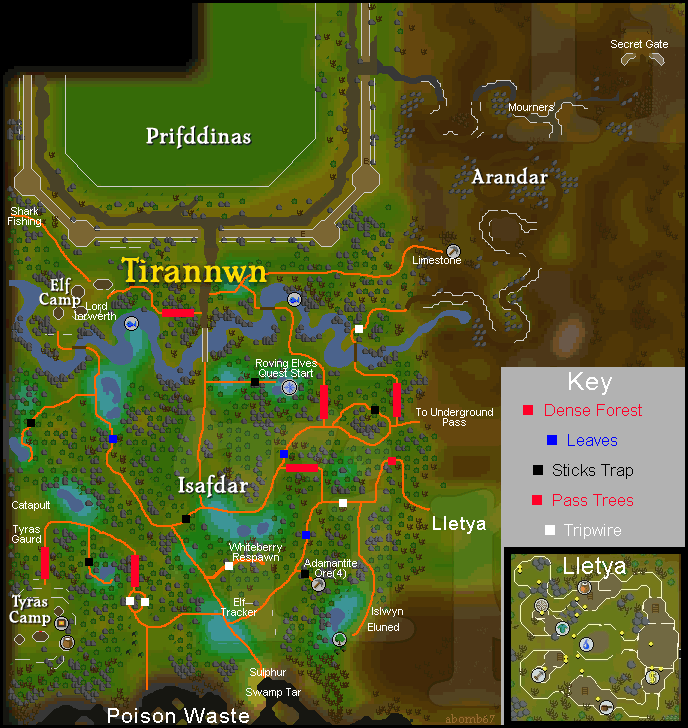 Turn south and run past the dire wolves to Islwyn, who is located next to the 3 magic trees. Quest journal changes: "Islwyn asked me about his grandmothers remains, which I had emptied in the chalice of eternity. When he was told where his grandmothers remains were he told me about elven tombs needing consecration. When I offered to help he said I should talk with Eluned, she will tell me how elven consecration is done. Eluned told me I must acquire the old consecration seed from the guardian spirit in Glarial&#39;s old tomb." If you have Glarial&#39;s pebble in your bank you can skip this part, otherwise you will have to go to the Tree Gnome Village. The Tree Gnome Village is the maze on the map, a quicker way is the teleportation tree inside the Gnome Stronghold. From here, go to the dungeon mark on the map. Go down and to the west. You will find an old man. Talk to him and get the pebble. Items for the next part: Glarial&#39;s pebble, food. Do not take any armour, weapons or runes. You will need to do this whether or not you have the amulet as well. Do not take any armour, weapons or runes with you. Make sure you have your prayer points filled if you plan on using magic or melee protection. Look on your world map for a building south of the Baxtorian Falls, it&#39;s east of the Gnome Stronghold, north of Ardougne and southwest of the coal trucks. The quickest way to the area is to use your Games Necklace to teleport to the Barbarian Outpost. From the building at the base of the falls, head a little north east till you see a small stone path leading to a tombstone. Use your pebble with the tombstone to get down. If it says that nothing happens, you are carrying an item that is not allowed down there, like a piece of armour, a weapon or some runes. Otherwise, you will be teleported into the tomb. Use any potions right here and put your prayer on, now run to the next room and you will find yourself attacked by a level 84 moss giant. He uses a combined magic and melee attack, so he hits with both in 1 hit. This means that either of these blocks will get his damage down, but not stop him completely. Protect from melee helped me the best (I killed 2 trying each block). I think this depends on your magic and defence level, or his melee part is just stronger. Either way, take him out with your bare hands to get the consecration seed. If you don&#39;t have Glarial&#39;s amulet, head further west to a chest, quickly open and search it with left clicks, since there is another moss giant here. Now run back to where you started and up the ladder. You will have to go all the way back to the quest start and talk to Eluned. She will enchant your seed. Quest journal changes: "I have given the seed to Eluned who has put new life into it by singing to it." Items for the next part: Rope, Glarial&#39;s amulet, Consecration seed, Spade, maybe some food and something to teleport with. First of all, if you are continuing this quest halfway and aren&#39;t sure where you left off, check if your quest journal says: “Planting the seed gave a surprising result as it grew a crystal tree”. If it does, skip this part. If it does not or you&#39;ve been following this guide all along, continue here. Take all the items for this part and go to the starting location of the Waterfall Quest. It&#39;s in the house north-west of the tomb where you got the pebble. If you&#39;re there, go to the west outside the house to find a raft. Use the raft to get down the river. You will crash halfway. Now go to the south of your little island and you will see a rock with a “swim to” option. Don&#39;t use this, use your rope on the rock instead. Here you will see a dead tree. Use your rope on that as well. You will find a door, make sure you are wearing Glarial&#39;s amulet before you try to go through it. From here, first take the path to the eastern room. Go to the crates located the furthest to the north. Search them to find a key. Now go back to the main room and then west. 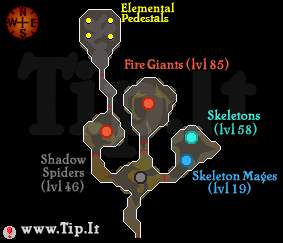 Go past the fire giants to a locked door. Use your key on it to get through (the same key spawns on the floor inside). Use the key on the next door to the north. You will be inside the room where you finished the Waterfall quest. Go to the urn and left-click the seed while standing next to it. You will dig a hole, bury the seed and see a small crystal tree growing. It will disappear right away. Either teleport out or walk outside the waterfall and get inside the barrel there. Quest journal changes: "Planting the seed gave a surprising result as it grew a crystal tree. I should go back to Islwyn to tell him the good news". Go back to Islwyn to claim your reward. You can pick either a crystal bow or shield as part of the reward. Both can be bought later on, although the bow is 900k and the shield “only” 750k, so it might be wiser to pick the bow.